Can chocolate milk build muscles? Costco is the only big box store I guiltily support (you know I am not perfect) only because of the convenience of buying large quantities of organic food (and dog food) for mountain living. I am amazed at regional differences in the amount of organic food available at different Costco stores. In a recent issue of the Costco Connection magazine, an article caught my attention bearing a photo of the organic Kirkland chocolate milk boxes my son adores, but I hate (packaging, packaging, packaging). If Mother Earth intended chocolate milk, she would give us chocolate cows, right? Besides, how do they keep that milk fresh when it is not even refrigerated? “Chocolate Milk: Post-workout recovery secret?” refers to four sports medicine studies that found chocolate milk better than other carbohydrate heavy sports drink at building muscles and replenishing muscle “fuel”. Heck, maybe I shouldn’t begrudge my son his favorite beverage after all. In this study, 13 male college soccer players participated in “normal” training for one week, then were given lowfat chocolate milk or a high-carbohydrate recovery beverage daily after intense training for four days. After a two week break, the athletes went through a second round of “normal” training, followed by four-day intensified training to compare their recovery experiences following each beverage (with the same amount of calories). Prior to the intense training, at day two and at the completion of this double-blind study, the researchers conducted specific tests to evaluate “markers” of muscle recovery. All of the athletes increased their daily training times during the intensified training, regardless of post-exercise beverage yet after two and four days of intensified training, chocolate milk drinkers had significantly lower levels of creatine kinase – an indicator of muscle damage – compared to when they drank the carbohydrate beverage. There were no differences between the two beverages in effects on, soccer-specific performance tests, subjective ratings of muscle soreness, mental and physical fatigue and other measures of muscle strength. The results indicate that lowfat chocolate milk is effective in the recovery and repair of muscles after intense training for these competitive soccer players. But dietitians say the study should help to counter the notion that high-tech, expensive supplements are better than whole foods when it comes to athletic performance. They also note that milk contains key nutrients, such as calcium and vitamin D, in quantities that sports drinks can’t match. My son is not a competitive college soccer player (he’s six-years-old), nor does he experience the intense training of these athletes. I do not think that his intake of chocolate milk is going to help him build muscles, nor does he drink carbohydrate-filled sports drink. 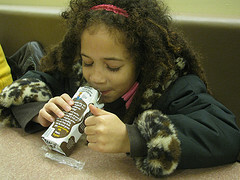 In fact, I suspect chocolate milk is just another culprit in the childhood obesity epidemic. Families in my local school district complain children are served chocolate milk with their free and reduced meals. I still think water is the best beverage for humans. « 10-Year-Old Discovers a Supernova on New Year’s Eve! The benefits of the “Hypersonic Weight Loss” system are almost too numerous to mention. For starters, I lost over 50 lbs and 37 inches of body fat. Thanks for this information! My pediatrician told me I could (even should!) give my 12 month old chocolate milk. This “research” about chocolate milk is even convincing physicians. What a ridiculous study. Comparing apples and steak. Milk has high protein which us needed for muscle repair. A carbohydrate drink contains higher calories for energy. Carbs and proteins shouldn’t be compared. The fact that the milk was chocolate is totally irrelevant. In fact, chocolate inhibits the absorption of calcium. The study should have compared plain milk to chocolate milk. Anyone who takes this study seriously just wants an excuse to drink chocolate milk. The soccer players could have had a rice protein smoothie or eaten some chicken, for that matter. This kind of science is just junk. Oh, and the dairy industry partially funded the study. All body builders will tell you that you need protein for repair, not just Gatorade type sports drinks. What is new here? What a waste of time and money.